Risotto (read here other news) that favourite of Italian dishes made into a creamy classic can be served with a variety of accompaniment including meat, vegetable, or fish. 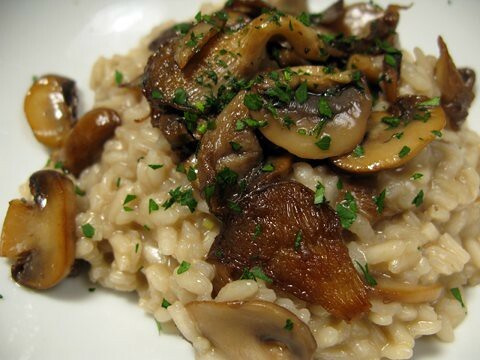 This is the Mushroom Risotto. To make you need 1 tablespoon olive oil, 3 small onions, finely chopped , 1 clove garlic, crushed , 1 teaspoonminced fresh parsley, 1 teaspoonminced celery, salt and pepper to taste , 1/2 cupssliced fresh mushrooms, 1 cup whole milk , 1/4 cup heavy cream , 1 cup rice, 5 cups vegetable stock , 1 teaspoon butter , and 1 cupgrated Parmesan cheese. To prepare, first heat olive oil in a large skillet over medium-high flame heat. Saute the onion and garlic in olive oil until onion is tender and the garlic is lightly browned. Remove the garlic and add the parsley, celery, salt, and pepper and cook until the celery is tender. Next add the mushrooms and reduce the heat to low, and continue cooking until the mushrooms are soft. Pour in the milk and cream into a saucepan and add the rice. Heat until it simmers and then stir in the vegetable stock into the rice 1 cup at a time, until it is absorbed. After the rice has been cooked, add the butter and Parmesan cheese, and remove from heat.